HOMSECUR alarm system is featured with very low failure rate(CE approved). Purchasing this kit from us, you will also enjoy our satisfactory and hassle-free service whenever you need help. Unlike traditional alarm systems that are complicated and require professional installers to setup, this alarm system has visible menu. It is very easy for you to setup the alarm system. You can adjust the menu language to English, Espanol, Deutsch, pyccknn, italiano, Dansk, Francais, Cestina, Indonesian. Free Android App and iPhone App are available on app store, it will help you to use the system more effectively. This alarm control panel has a built-in temperature sensor, it will send alert SMS to you when the indoor temperature is higher or lower than the preset temperature range. You can install some sensors in your parents\' bedroom, if they don\'t get up(open bedroom\'s door) during the preset monitoring time period, the system will send alert SMS to you. This WCDMA-3G alarm system is a good home security alarm solution for residential and business security. It has friendly menu and 9 languages menu for easy operation. You can set 10 kinds of zone types for each defense zone to ensure your family and assets be protected 7*24 hours. It can do more than your imagination for your safety and smart living. In addition to arm/disarm button on alarm control panel and remote controllers, you can also activate or deactivate this alarm system via SMS, Android/iPhone APP, providing you real-time access to property security wherever and whenever you are. 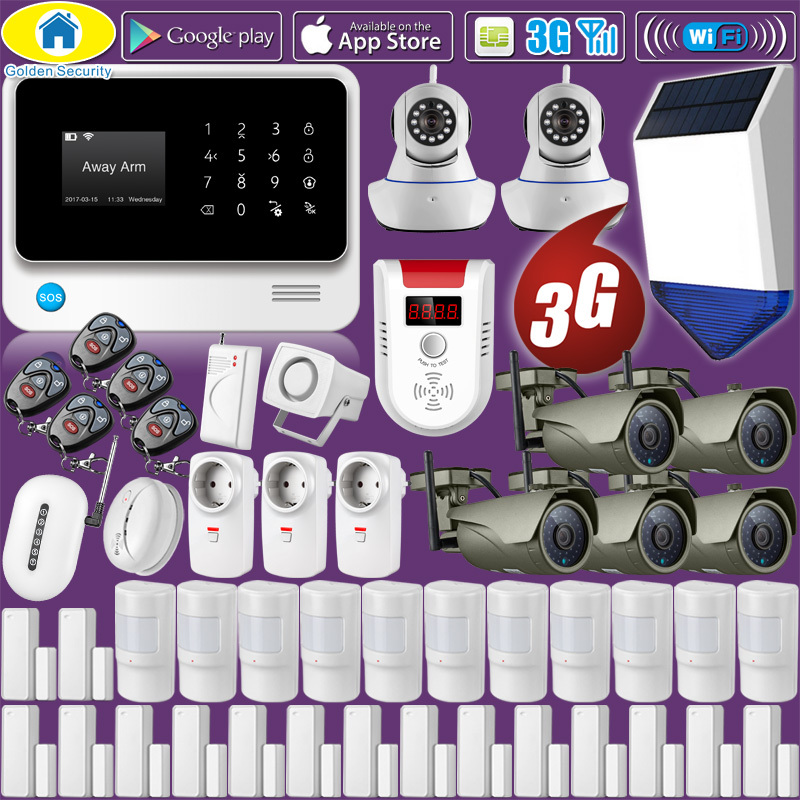 Android user, please search "K9 GSM Alarm System" to download the APP. iPhone user, please search "GSM 3G Touch Keypad Alarm System" to download the APP. The alarm system can be triggered by any detectors (PIR sensor or door/window sensor) or the SOS button on remote control and alarm panel. Once the system is triggered alarm, it will send SMS with detailed information and dial the preset phone numbers. The built-in siren will also sound at the same time to attract attention. Effectively protect what truly matters. By pressing SOS button on remote control or alarm panel, the alarm system will be triggered with sounding siren for attention and automatically dial the designated phone numbers to enable on-site communication. It provides great convenience in case of emergency, especially for kids, seniors, disables and people who may need help. Optional wireless accessories can be added to provide control over other functions including wireless smoke sensor, wireless gas leak sensor, Pet-immune(Pet friendly) PIR, wireless signal repeater, emergency key to meet your need of beefing up your Home security alarm system. Providing WS1(Optional) for the lock and this alarm system, you can open the door by remote control or incoming phone call for your convenience. Please contact us for quotation of WS1 if this function is requested.